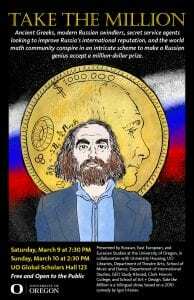 A fun way to learn Russian! Russian, East European and Eurasian Studies (REEES) and University Housing, in collaboration with the UO Libraries, Theater Arts, School of Music and Dance, International Studies, GEO Study Abroad, Honors College, and School of Art + Design present their annual bilingual show, “Take the Million,” based on a 2010 comedy by Igor Irtenev. 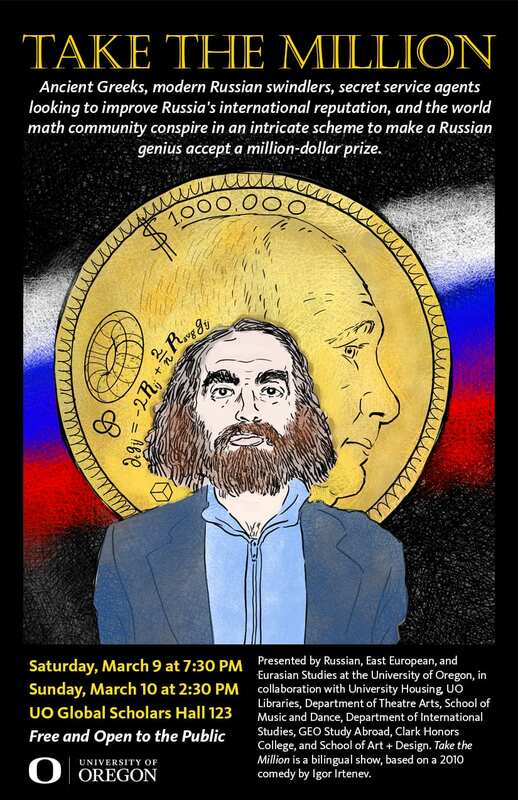 Ancient Greeks, modern Russian swindlers, secret service agents looking to improve Russia’s international reputation, and the world math community conspire in an intricate scheme to make a Russian genius accept a million-dollar prize. The show is free and open to public, on Saturday, March 9 at 7:30 p.m., and Sunday, March 10 at 2:30 p.m. in the UO Global Scholars Hall, 123. Russian Theater is sponsored by REEES in collaboration with UO Libraries.